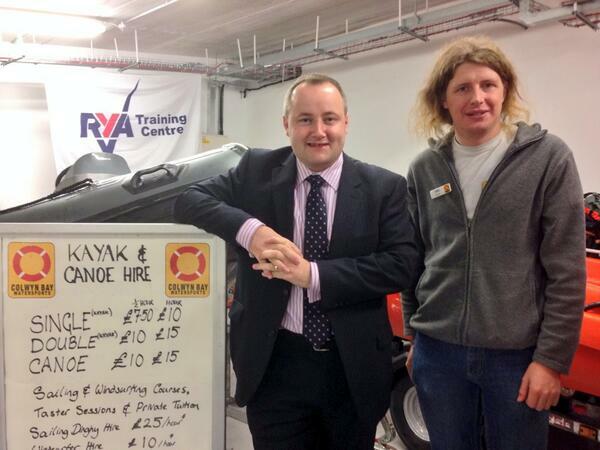 Clwyd West AM Darren Millar visited Colwyn Bay Watersports on Monday to find out more about social enterprises and how they are benefitting the local area. Darren visited Colwyn Bay Watersports’ new facilities at Porth Eirias, a destination for watersports lovers across the whole of North Wales. The visit was organised by the Wales Co-operative Centre to coincide with Social Enterprise Day on Thursday November 21st. The Centre supports social enterprises and co-operatives and is mainly funded by Welsh Government and the European Regional Development Fund. As a social enterprise, Colwyn Bay Watersports has a remit to help strengthen the local area by providing local services and jobs. Its key aims are to bring visitors into the area to enjoy a host of watersports activities; encourage local secondary school children, particularly those from deprived backgrounds, out on the water to enjoy water sports; encourage young people to gain professional water sports qualifications which will enable them to get jobs in the industry; and to host a range of events which will help make Colwyn Bay a vibrant seaside town. This entry was posted in News on November 29, 2013 by cbw.